Decipher’s inaugural Global Lateral Hire Risk Mitigation Study examines how Am Law 200 firms identify, evaluate and address the risks associated with lateral partner hires. Given that close to 60 percent of Am Law 200 lawyers have practiced with at least one other firm at some point in their careers, it’s no surprise that managing partners have focused attention on integration. 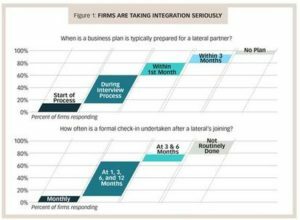 Managing partners should be proud of what they’ve accomplished: 60 percent of firms are preparing business plans for lateral partners before they join, and a further 20 percent within a month of joining, according to our recent survey of senior leaders at 30 randomly-selected Am Law 200 firms (see Figure 1). Similarly, 75 percent of firms have formal check-ins with laterals at least quarterly after their joining. However, when we look at the overall success of firms’ lateral hiring programs, the picture loses some of its cheer. The firms in our survey acknowledge a 30 percent departure rate at five years, a self-assessment that is kinder than the 38 percent that we know from objective market analysis. The departures comprise a combination of (1) partners who didn’t work out and thus were asked to leave, and (2) those who were working out (or moving that way) but, by leaving so soon, didn’t stay long enough to cover the cost of their hiring and initial down time. Add to these departed laterals those who are just “muddling along” and it’s easy to see that close to half of lateral partners fail to live up to expectations. So, what goes wrong? Our survey makes this clear: Laterals disappoint on the volume of business they attract to their new firms (see Figure 2). Every firm in our survey reported challenges with laterals’ purported books of business actually transpiring. Similarly, 75 percent of firms report that laterals “sometimes” or “often” expect more work to be given to them than is reasonable, and 90 percent run into business development issues. By contrast, only one-third of firms regularly encounter client conflict problems, while two-thirds encounter cultural fit issues. The frequency with which laterals encounter volume-of-business challenges is incongruous. Incremental business is not a tangential issue; typically, it is at the heart of why firms pursue lateral partners in the first place. 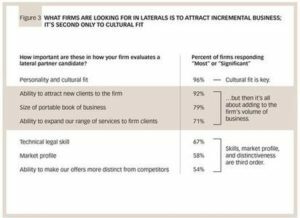 As Figure 3 shows, after cultural fit, the different ways a lateral can attract incremental business—attracting new clients, porting a book of business, serving firm clients in new areas—are the factors considered most important by hiring firms. It’s befuddling, given the importance attached to these factors, that they are not the focus of the information firms typically gather about potential laterals. Meaningful insight on the potential for incremental business volume could be gained by talking with former colleagues, former clients, references and market peers. Yet half of firms eschew making such inquiries (see Figure 4). It would appear that firms actively choose not to talk with the people best positioned to provide them insight into a critically important aspect of a high-risk investment decision. While the retention challenges with laterals have been recognized for some time, our survey highlights a less-broadly discussed, more troubling, and probably related challenge: malpractice risk. Over 35 percent of firms surveyed reported a malpractice issue arising with a lateral partner within five years of the lateral’s joining. Indeed, on pursuing this further, we found one major professional liability insurer willing to share with us that they estimate that 1 in 5 malpractice claims are directly related to lateral hires. This is compounded by the fact that malpractice settlements are getting larger: The ABA’s 2015 Profile of Legal Malpractice Claims reported an almost fourfold increase in indemnity payments over $2 million from 2011 to 2015, with 25 individual claims resolving at over $5 million. While malpractice risk is not as easy to assess as, say, that of not realizing a putatively portable book of business, this doesn’t mean that firms should ignore trying to assess it. Indeed, the two are related: one can imagine that the pressure to realize the book of business promised to a new firm could increase the probability that a partner takes risks in the scope of their practice. We know such pressures could be exacerbated under certain personal circumstances—sadly, malpractice claims seem to be more common with partners undergoing financial or other stress outside of work. 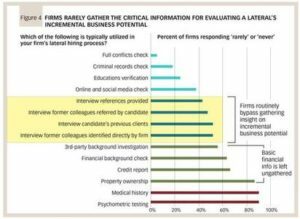 Despite this, firms routinely bypass undertaking credit reports, financial or third-party background checks, again see Figure 4. Similarly, medical information and psychometric testing, while routine in the corporate world, appear anathema to law firms. Only conflicts, criminal record and education checks appear routine. Another missed opportunity is to involve those most likely to focus on issues of risk—the law firm’s general counsel and CFO—in the interviewing and vetting process. 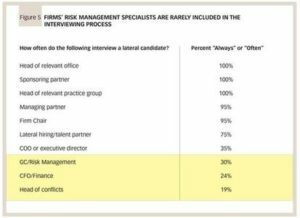 Indeed, our survey shows that a firm’s risk management specialists are the least likely to interview the candidate (see Figure 5). This point should not be lost on professional liability insurers. We are not aware of any insurers yet pricing coverage differently for firms with higher proportions of lateral partners or of requiring specific due diligence steps in a covered firm’s lateral hiring process. However, such initiatives would appear worthy of consideration. It’s tempting to say that the way to improve the efficacy of lateral hiring programs is for firms simply to gather more and better data. While true, this does not get to the heart of the issue. After all, firms know that retention rates disappoint, incremental business volumes don’t materialize, and malpractice risks amplify. They are affirmatively choosing not to undertake the relevant due diligence. It’s worth considering a couple of hypotheses for why this is so. One is that the recruiting process suffers from a lack of objectivity. No one wants to tell the partner who is enthusiastic about hiring a particular lateral (typically a senior partner) that they need to gather the data or, worse even, no one wants to highlight negative data that is already available. It’s not worth it for a partner or staff member to raise the objections—lots of downside, no upside—so people stay quiet. Another hypothesis is that, at some firms, there may simply be no consequences for those involved in hiring a lateral partner if the lateral doesn’t work out—no one is identified as accountable, there are no consequences for the partners who sponsored the lateral and were encouraging the hire, and management teams make no systematic attempt at learning from their lateral hiring successes or failures. Don’t fall victim to your own success: Law firm leaders are hugely capable and phenomenally successful people. They’ve developed instincts that enable them to identify a great lawyer when they see one. But no one’s instincts are beyond being informed with independent data. Set the stage: Review lateral history objectively with the firm’s leadership. Get everyone on board to see that there’s a real opportunity for improvement and quantify the costs of hiring mistakes. Change the process: Start including the basic due diligence steps of talking with former clients and colleagues. For many firms, it might be easier to get this done objectively by using an independent third party rather than by having the partners promoting the lateral’s cause do the fact-gathering. The investment economics in this are compelling: A firm for whom only 3 of every 10 laterals are hiring errors is doing better than average. If a $20K third-party evaluation led such a firm to sidestep just one of the mistakes at an average cost of $1M (recruiting fees, compensation paid while unproductive, time invested in screening and on-boarding), it will have achieved a 5x return on its outlay. Firms should also gather data on any malpractice claim history. Change the process owner: The partner overseeing lateral recruiting should be someone who by nature is skeptical, adept at playing devil’s advocate and unafraid of speaking truth to power. This person has to be reasonably senior—so as not to be steamrolled by other partners—and has to be backed up 100 percent by firm leadership. No workarounds or undercutting. Make clear who is responsible: Assign a single partner as responsible for each lateral’s success. Make this person’s role broadly known. Make reviewing how their laterals are doing an explicit part of the responsible partner’s annual review. Not only does this introduce greater accountability to the recruiting process, but it helps with integration as it ensures that the responsible partner has skin in the game. It’s time for law firm leaders to treat the lateral hiring process as they’d advise any client treat a multimillion-dollar investment program—do the necessary diligence, monitor performance, laud successes and quietly hold people accountable for failures. Michael Ellenhorn, co-founder and general counsel of Decipher, is an entrepreneurial leader, lawyer and solicitor (England and Wales, nonpracticing), with more than 20 years of success building and strengthening professional services businesses. Decipher’s inaugural Global Lateral Hire Risk Mitigation Study is the first comprehensive study of how Am Law 200 firms identify, evaluate and address the risks associated with lateral partner hires. The study involved the collection of data from a representative selection of Am Law 200 firms, to gain a real understanding of these activities and their perceived efficacies. The survey generated responses from relevant law firm leadership from more than 15 percent of Am Law 200 firms, including general counsel and chief talent officers. Decipher (decipherglobal.com) is a competitive intelligence business serving law firms, companies and investors.